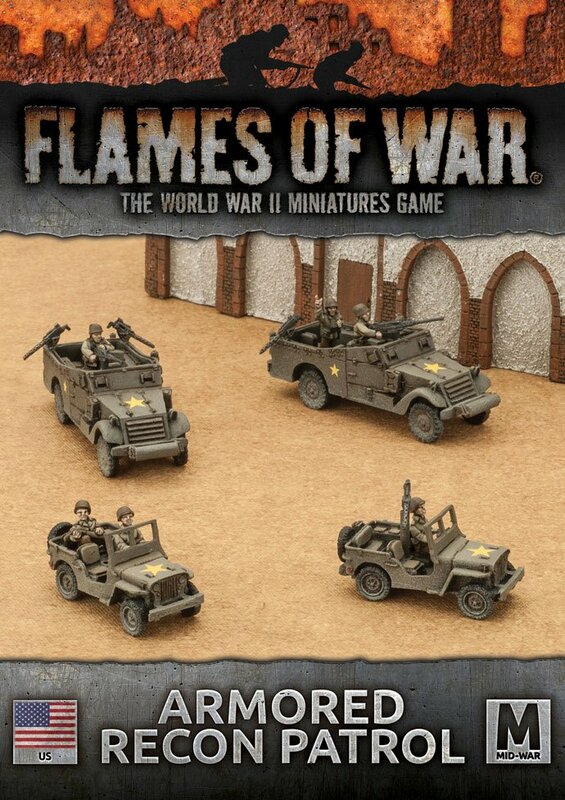 Flames of War > Flames of War Plastic Models > U.S.A.
Includes two metal and resin M3A1 Armored Cars, two metal and resin Jeeps, one plastic Commander sprue and two Unit cards. Each Armored Recon Platoon has two patrols of four vehicles each. The US Army likes its reconnaissance units to pack a punch. The M3A1 carries three machine-guns—one .50-calibre (12.7mm) and two .30 calibre (7.62 mm) mounted on a sliding rail around the top of the passenger compartment. Before it speeds back to report on enemy positions, it is more than capable of mowing down any enemy infantry caught in the open.